Ursus arctos is one of the largest living carnivores. However, the size and weight of this bear varies considerably between populations. It is a consequence of both genetic factors and nutrition. The Brown Bear is 1 to 3 m in length from head to rump and 90 to 150 cm tall at the shoulder. Average weights are close to 200 kg for males and 135 kg for females. In all populations, males, on average, are larger and outweigh females. Weight also shows large seasonal fluctuations. The heaviest individuals have been found in populations with access to salmon in coastal Alaska. Some males can weigh as much as 780 kg. The smallest ones are found in Southern Europe and Alberta (Canada), where females average between 70 and 55 kg respectively. Fur is usually dark brown, but varies from cream to almost black. They moult once a year; and have small, round ears, a distinct shoulder hump, and a small, invisible tail. 10% of the sale price of this neckwarmer is donated to the environmental NGO FAPAS. For further information about the work carried out by FAPAS, take a look to this page. Formerly, Ursus arctos could be found across a large area of North America (including Northern Mexico), throughout Europe, Asia, the Middle East, and even once in North Africa. Nowadays the largest numbers are to be found in Russia, where there are currently more than 100,000. Alaska has 31,000 individuals and Canada 25,000. There are also several populations in Northern and Eastern Europe, with Romania boasting some 5,000 bears, and Sweden 3,500. However, a history of prolonged over-exploitation stretching back centuries has resulted in the elimination of the Brown Bear from many European countries. In Southern Europe only extremely small and isolated populations can be found, with the distribution of individuals as follows: Greece 150, Cantabrian Mountains 200, Abruzzo 40, Trentino 50, and Pyrenees 30-35. Populations are also tiny and fragmented at the most southern points of Asia and North America. In the Middle East they seem to have been eliminated from Syria and possibly Bhutan. The date of their extirpation from North Africa is uncertain. Globally the population remains large, and is not significantly declining. There are small, isolated populations that are at risk of extirpation; but others, due to increased protection, are expanding. Mating takes place from spring to early summer. During oestrus female Brown Bears copulate with multiple males. Having 2 periods of oestrus per breeding season is common in females in the wild. Males travel long distances in search of potential mates. They also copulate with various females. In general, females control the mating. In female Brown Bears, ovulation is caused by copulation, as it increases the chances of becoming pregnant. In addition, implantation is delayed. This means that the fertilized ova remain dormant in the uterus for about 5 months and do not become implanted until November-December, when the female enters her winter sleep. Seasonal polyoestrous combined with delayed implantation explains why multi-paternity occurs quite frequently. Cubs are born between January and March, after a gestation period of 6-8 weeks, while the mother is hibernating. Litter sizes typically range from 1 to 3 cubs. Brown Bears reach sexual maturity relatively late. The average is estimated to be 3.5-6 years. They have long reproductive cycles. Females do not ovulate again for 2.5 to 6 years after giving birth. This varies according to the survival of offspring, as well as environmental and geographical conditions. The young are born blind, with only a fine hair covering and limited mobility. Cubs weigh less than 1% of the mother’s weight, in other words between 285 and 600 gr. They need to be fed by the mother. Lactation lasts for 1.5 to 2.5 years, although they eat a wide variety of foods from about 5 months of age. Maternal care continues between 1.5 and 3.5 years. The risk of mortality is particularly high for cubs during the first year. Once abandoned by the mother, they usually stay with her for an additional year. Paternal care is absent. Infanticide is considered the major cause of death among Brown Bear cubs. Researchers disagree on the reasons for this. Some argue that males kill unrelated and dependent offspring in order to shorten the female’s interval to the next oestrus. In this way, they have a higher probability of siring young, either directly by mating with the females, or indirectly by reducing the competition between males. Others maintain that male’s only aim is to reduce the prospective and immediate competition. Brown Bears have an excellent sense of smell, human-level hearing, and relatively poor eyesight. Therefore, they communicate primarily by smell and sound, being able, for example, to follow the scent of a rotting carcass for some kilometres. Researchers disagree as to why Brown Bears scratch and rub on trees. 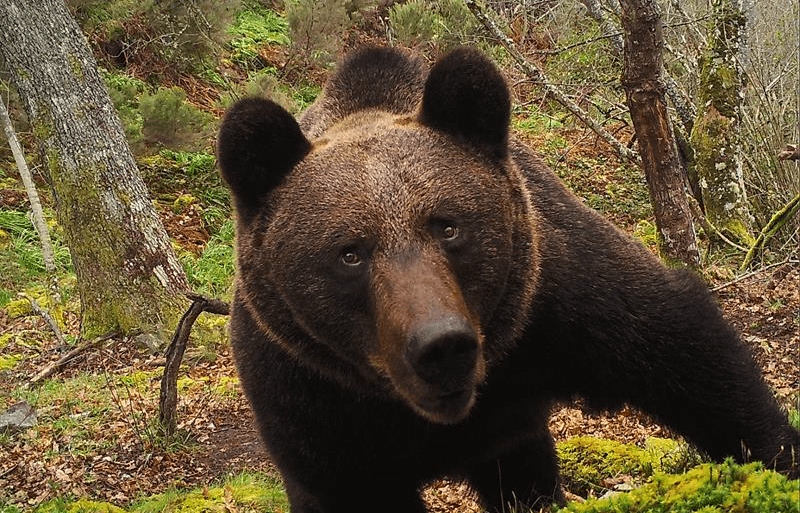 A recent study states that marking trees may be a means for adult males to become familiar with each other, and that this scent familiarity perhaps plays a part in reducing fighting among adult male bears. When angry or frightened, they tend to make noise. Brown Bears occupy a variety of habitats, from dry steppes to ice fields and high mountain forests. You can find them from sea level to 5,000 m above. The principal habitat requirement for Ursus arctos is an area with dense cover in which to shelter by day. Brown Bears are solitary animals, except for mothers with cubs (the only social bonds formed are between females and young) and when they are mating. Also they may group together around a food source. They tend to have home ranges rather than strict territories, as they are essentially non-territorial. Home ranges can be as large as 4,000 sq. km. and as small as 5 sq. km., varying according to the availability of food in each habitat. Male ranges are much larger than females ones, and home ranges can overlap extensively. Ursus arctos moves with a slow, lumbering walk, although it is capable of reaching 50-60 km/h. It is mainly terrestrial, but can often be seen swimming or preying upon fish in the water. Adults may have difficulty climbing trees. They stand on hind legs to inspect their surroundings, to intimidate the opponent, or to reach food. They are usually active at night or in the twilight, and tend to rest during the daytime (partly to escape human presence). Only females and their cubs are active diurnally. They take refuge in caves or dig their own dens (normally on sheltered slopes), lying on beds made from dry vegetation. Dens can be used repeatedly year after year. October to December marks a period of inactivity for the Brown Bear, with full activity resuming between March and May. Before hibernating they eat large amounts of food in order to increase their layer of fat. The length of the hibernation depends on location, weather and the condition of the individual. In southern areas it is very brief or may not occur at all. Hibernation is marked by a deep sleep. The heart and breathing rates decrease. Also body temperature drops a few degrees. Bears stop eating, drinking, defecating, and urinating. Vital signs are maintained due to the energy stored in the accumulated fat reserves. Brown Bears are omnivorous, but mainly eat vegetables. They adapt their diet according to the seasonal availability of food and the geographical area in which they find themselves. In spring they eat grass, sedge, bulbs, and moss. In summer and early autumn they feed on berries, acorns, bulbs, and tubers. Insects, fungi, and roots are eaten year round. Ursus arctos also eats small mammals such as mice, ground squirrels, marmots, and other animals adapted to subterranean life. Besides, carrion is also eaten when available. In the Canadian Rockies, bears are quite carnivorous, hunting mountain sheep, goats, elk, and moose. In Alaska moose calves and caribou might be caught. In Europe, preying on sheep, cows, horses, or goats is very sporadic, even exceptional. 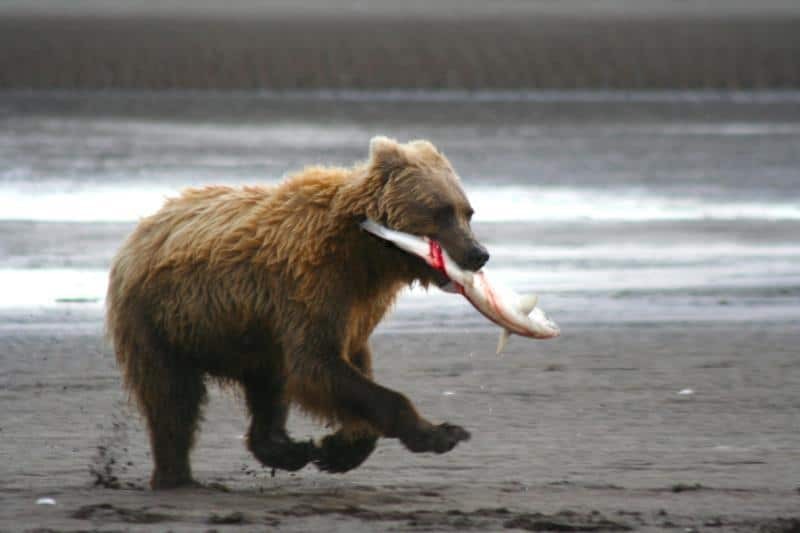 Along the Pacific coast, Brown Bears also feed on salmon in summer. Because of their size and aggressive response to threats, Brown Bears are not often preyed upon. Human have persecuted them throughout recent history; and occasionally other bears, mountain lions, or wolves may attack some cubs. Average lifespan in the wild: 25-30 years. Maximum lifespan in captivity: 47 years. The worldwide population of Ursus arctos is estimated to exceed 200,000 individuals. The largest populations are found in Russia (more than 100,000), Alaska (31,000), and Canada (25,000). There are also big populations in China (7,000), Romania (5,000), Sweden (3,500), and Japan (2,000). Although there are relatively large numbers of Ursus arctos across an extensive range, the Brown Bear population has declined in both numbers and distribution due to the impact of humans. Thus, several small and isolated populations are seriously threatened. The major threat is habitat alteration and destruction, resulting from the conversion of forest to farmland, excessive forest harvest, and human settlements. Logging, mining, roads, hydroelectric developments, resorts, golf courses, or ski slopes have invaded the bear’s natural habitat. In addition, in some locations Ursus arctos is pursued and killed for sport, or to sell its parts in medicinal products. It is also killed to protect crops or livestock, although its actual impact on these industries is negligible. Brown Bears are the ‘umbrella’ species in the ecosystems they inhabit. With the conservation of Ursus arctos and its habitat, maximum biodiversity can be preserved. 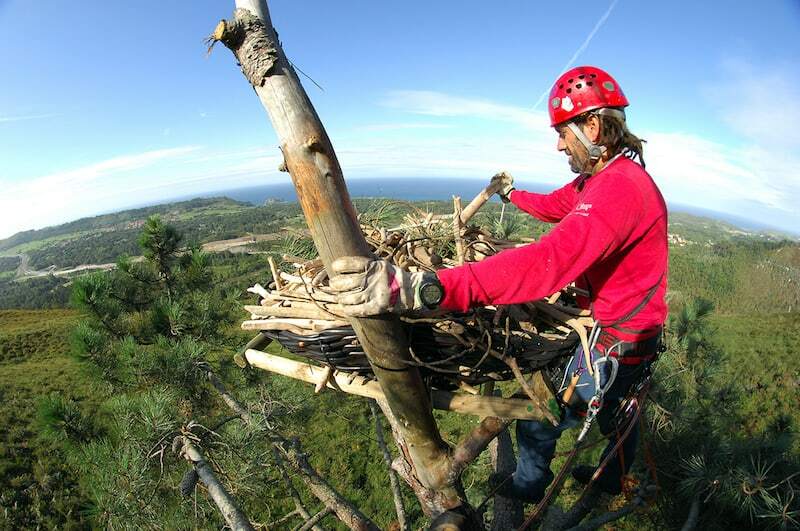 In turn, this contributes to the maintenance of resources, which sustain human populations and fuel the ecotourism industry. Conservation organizations are working hard to confront these threats. However, many countries simply do not have the resources to develop, implement and enforce adequate management plans for Brown Bears. Evaluated by the IUCN Red List of Threatened Species as Least Concern (2016). Females typically mate with 3 to 4 males during breeding season, although some females have been observed to mate with up to 20 partners. Males mate with 1-8 females per breeding season, even though many males do not manage to mate at all. Female promiscuity is generally acknowledged to aid in infanticide as a result of paternity confusion, either directly by male recognition, or indirectly because of multiple paternities. Brown Bears have long been considered an extremely dangerous animal, although the danger of attack from this animal is often exaggerated. In general, they attempt to avoid human contact and do not attack. They are unpredictable only when startled at close quarters, particularly if with the young or while feeding.